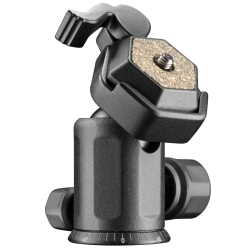 Small, handy, lightweight and therewith a ideal Ball Head for travelling and outdoor shootings: This is the professional Ball Head FW-591 out of our walimex pro series. 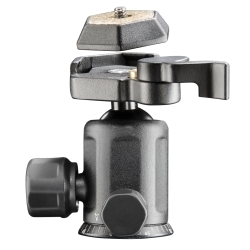 The small Ball Head provides a precise camera work and smooth-running movements. 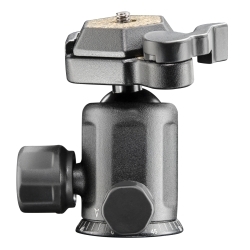 It has a reliable quick-release device, which facilitates the change from the camera to the tripod. Furthermore, the scale open up new vistas regarding panorama shootings for instance. Also with reference to the connection, you cannot be more flexible, because the 1/4 inch camera connection and 1/4 and 3/8 inch tripod connection provides established connection possibilities. The maximal load capacity of this Ball Head is approx. 4kg, therefore ideal for SLR and digital cameras.